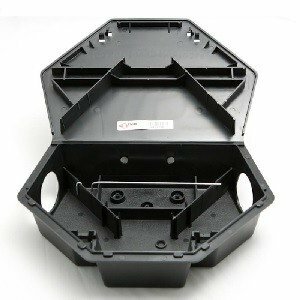 Protecta LP is a "Low-Profile"(LP) bait station that is shaped to fit flush along walls on rodent travel paths. Tamper-resistant for child and pet protection. Protecta LP is compatible to hold Bell's Blox & Super-Size Blox. Great in wet areas, where bait is elevated and water drain hole is present. One-piece inner liner makes cleaning a breeze! 13' across x 3 3/8" tall x 9" deep. Dimensions: 13" across by 9" Deep by 3 and 3/8"
The Protecta LP rat bait station is a triangular shaped bait station that fits in corners and along walls where rodents travel. The Protecta LP rat bait station locks automatically when closed and uses a special 2-prong key to open.